Neatly hidden by a candle on a dining table, this strategically placed recording device was an everyday tape recorder. Nothing fancy, but certainly effective. The handheld playing device was a little more ahead of the game at the time of the film’s release. So, you're sitting at the dining table - how best to hide your recording device? 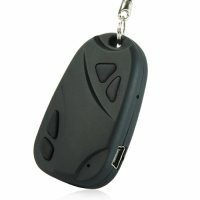 This gadget is a Mini Spy Camera inserted into a car remote style casing - the discrete mini spy camera is disguised as a standard car alarm remote on a keychain. This is a great spy gadget that is easy to use. You can record high quality colour video at 640 x 480 (VGA) resolution at 30 FPS for smooth playback - simply connect the spy device to your PC via USB to view your recorded footage.